On August 15, 2012 -- three days before my wedding! -- culinary icon Julia Child would have celebrated her 100th birthday. I'm thrilled to announce that I have been invited to join a select group bloggers for the JC100, a national campaign designed to celebrate Julia and her achievements in the world of food. 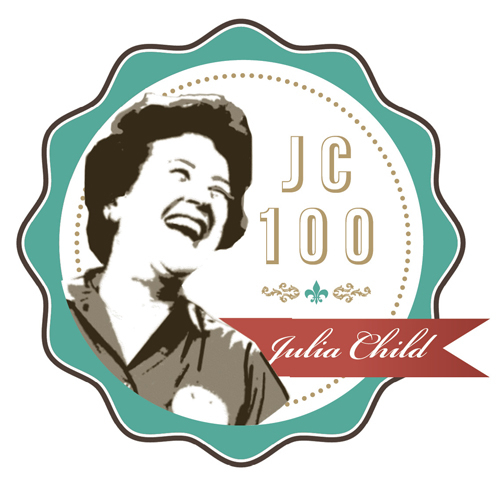 Each Monday, in the 100 days leading up to Julia's birthday, JC100 participants will receive a specially chosen recipe of hers to prepare, photograph, and write about. By sharing these recipes (and variations on them), we will be honoring Julia's life and career while, at the same time, introducing her legacy to a whole new generation. The JC100 kicked off on May 7, and the first recipe up is Julia's classic Omelette Roulée (Rolled Omelette). Unfortunately, I'm about to leave town for a few days to celebrate my own birthday and won't have access to a kitchen to prepare my version. I don't want to miss out on the festivities, so I've decided to talk about omelettes and how they affect me as a food lover and as a home cook. As most of you know, I love brunch and going out for brunch on the weekend is one of my favorite pastimes. When it comes time to order, I gravitate toward the egg dishes and leave the sweeter choices -- the pancakes and the French toast -- to Stephen. If I'm not ordering eggs over-easy, then I'm ordering an omelette, preferably with caramelized onions, cheese (cheddar, farmer's cheese, and pepper jack are my favorites), and sauteed mushrooms. And, when bacon isn't "on the side," then it's in there with everything else. I can't explain it, but there's something about digging into a tender, creamy omelette that's so damn satsifying. Another thing I can't explain? My sheer lack of omelette-making skills at home. Despite putting in my best effort and making repeated, well-intentioned attempts, I can't make an omelette. They always seem to come out like scrambled eggs with stuff in them, and it's really embarrassing. Thankfully, Stephen's been extremely patient and doesn't mind eating the "rejected" ones. I'm just going to have to have courage and keep practicing, using Julia's recipe as a guide. How do you feel about omelettes? What are you favorite fillings? Do you have trouble making them at home like I do? For 1 omelette, 1 to 2 servings. Time: Less than 30 seconds of cooking. Beat the eggs and seasonings in [a] mixing bowl for 20 to 30 seconds until the whites and yolks are just blended. Place the butter in [an omelette pan 7 inches in diameter at the bottom] and set over very high heat. As the butter melts, tilt the pan in all directions to film the sides. When you see that the foam has almost subsided in the pan and the butter is on the point of coloring (indicating it is hot enough), pour in the eggs. It is of the utmost importance in this method that the butter be of the correct temperature. Let the eggs settle in the pan for 2 or 3 seconds to form a film of coagulated eggs in the bottom of the pan. Then increase the angle of the pan slightly, which will force the egg mass to roll over on itself with each jerk at the far lip of the pan. As soon as the omelette has shaped up, hold it in the angle of the pan to brown the bottom a pale golden color, but only a second or two, for the eggs must not overcook. The center of the omelette should remain soft and creamy. If the omelette has not formed neatly, push it with the back of [a] fork. Turn the omelette onto [a plate...], rub the top with a bit of butter, and serve as soon as possible. Excerpted from Master the Art of French Cooking by Julia Child. Copyright ©1961 by Alfred A. Knopf. Reprinted with permission from the publisher Alfred A. Knopf, a division of Random House, Inc.